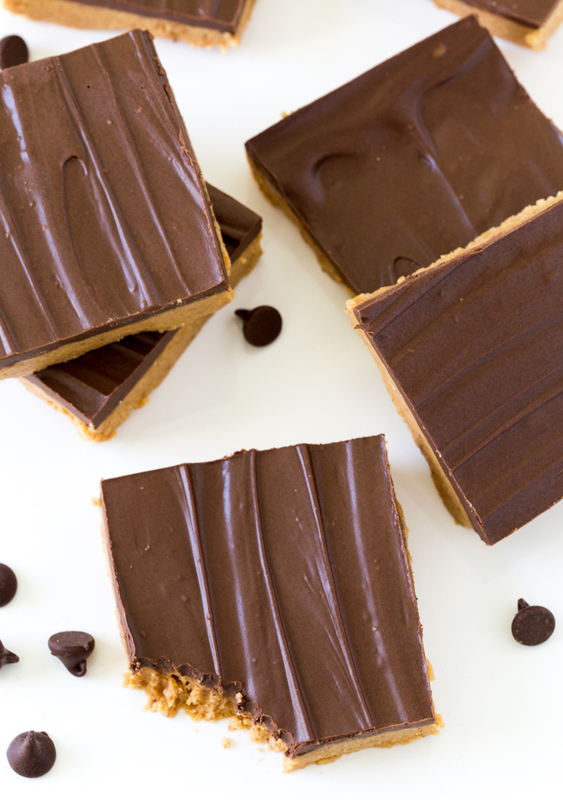 5 Ingredient Peanut Butter Chocolate Bars. Super easy to make and extremely addicting! Takes less than 20 minutes to make and is no bake! Are you a peanut butter lover like me? Well then these bars are for you! 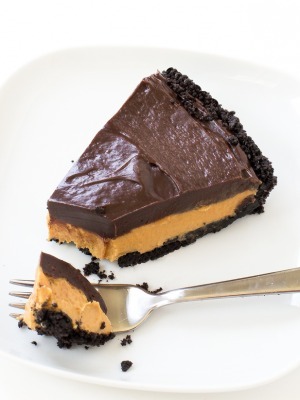 Creamy peanut butter filling layered with a chocolate peanut butter shell on top. It’s the perfect blend of peanut butter and chocolate and is ridiculously simple to make. You only need 10 minutes of prep time and an hour in the fridge. That’s it! The hardest part of this recipe is waiting for it to set in the fridge. They are an awesome dessert to make ahead. Not to mention they are no bake and only require 5 ingredients! Most of the ingredients are probably already in your pantry. Simply combine the butter, graham cracker crumbs, peanut butter and powdered sugar. Layer it into a 9 x 13 pan. Top with melted chocolate and peanut butter. Place in the fridge until set and cut into squares! For a salty twist top with crumbled pretzels or peanuts. Serve these with a tall glass of milk and enjoy! 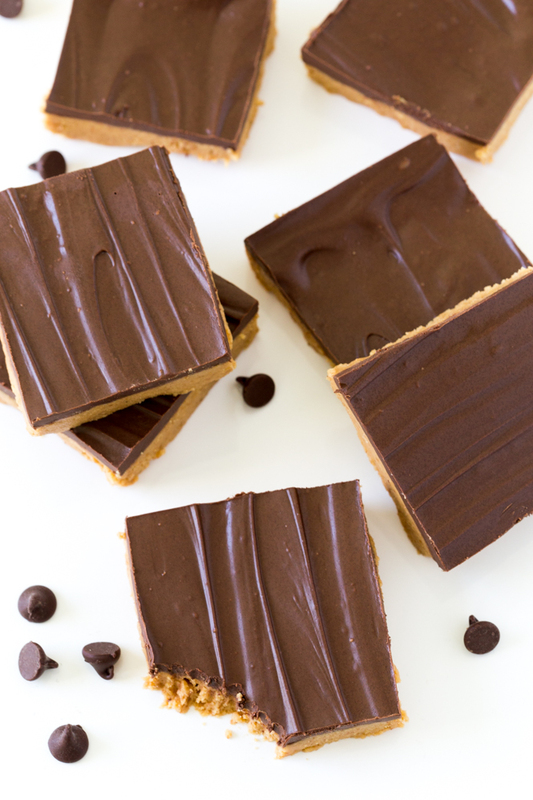 5 Ingredient Peanut Butter Chocolate Bars. Super easy to make and extremley addicting! Takes less than 20 minutes to make and is no bake! Spray a 9 x 13 pan with cooking spray. Set aside. Add butter, powdered sugar, 1 cup peanut butter and graham cracker in a large bowl. Mix to combine. Layer into the prepared pan. Add the 1/2 cup of peanut butter and chocolate chips to a small bowl. Microwave in 15 second intervals until fully melted. 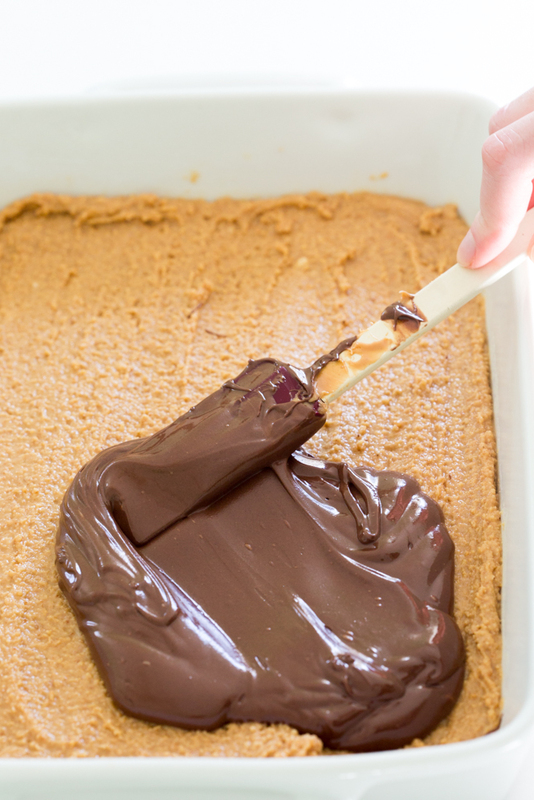 Pour onto of the peanut butter layer and smooth with a rubber spatula. Place in the refrigerator to firm up for an hour. To serve, cut into squares and enjoy! I’m not a huge sweets person, but I have an incredible weakness for peanut butter and chocolate desserts! Drooling over here! You can’t go wrong with chocolate and peanut butter! I love that these are no-bake and so quick to put together! OMG 20 minutes and no bake?! They look amazing, especially with the contrasting peanut butter and chocolate layers. Gorgeous! I am definitely a peanut butter lover and peanut butter and chocolate just go SO well together. The perfect little treat. I’ve made similar before and these always turn out so well! You can’t beat peanut butter and chocolate! Do u need to keep it refrigerated at all times? I like to keep these refrigerated. This helps keep the chocolate from melting and getting too messy. 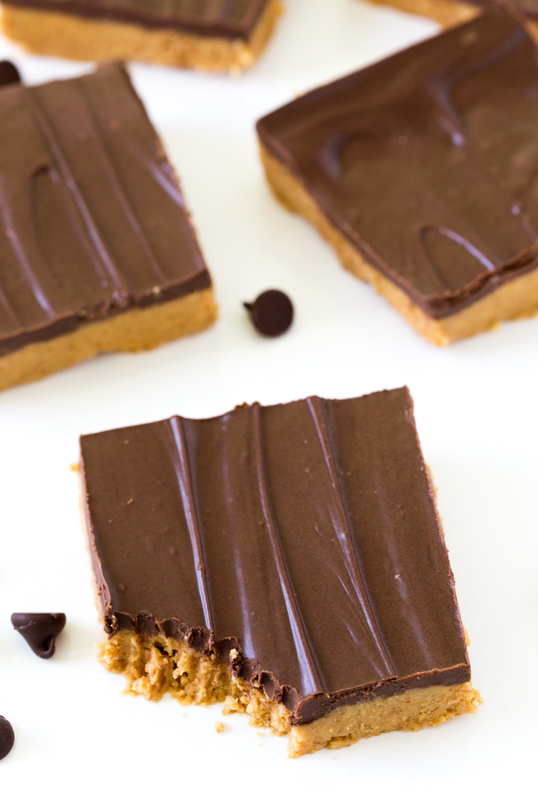 I can just tell that I would lose ALL self-control around these peanut butter chocolate bars! They look so fudgy and irresistible! 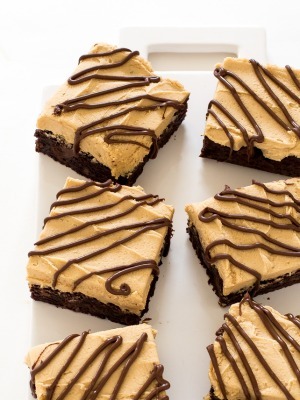 Love pb bars and these look so easy to make and delicious! Pinned! Mmmm I adore how easy these are and what is better than chocolate and peanut butter? NOTHING! Who isn’t a peanut butter lover???! My husband would absolutely die over these! I make a bar just like these and they are UNREAL. I’m definitely going to need to try this version! So perfect for the holiday baking trays! These bars look incredible! I’m a huge fan of PB&C, and need to make these for sure! These looks so good!! 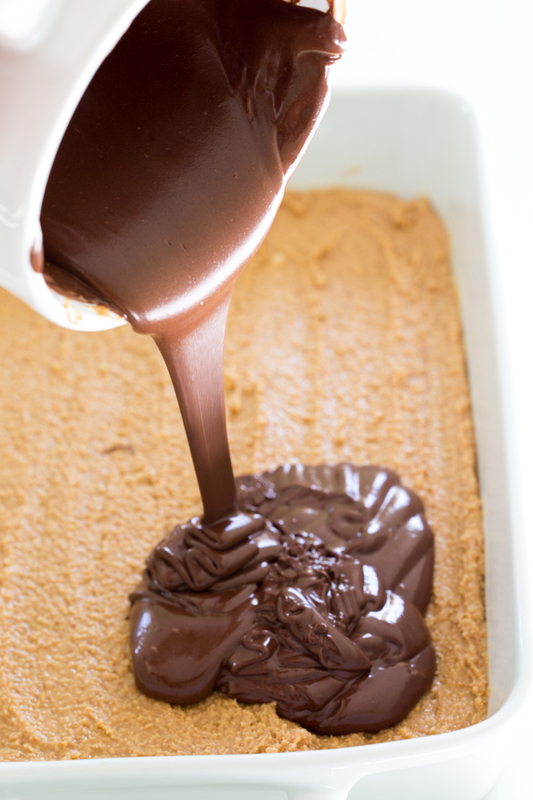 I love peanut butter and chocolate together and I’m pretty sure I could eat the entire pan! Yaaahhhsss, I am a HUGE peanut butter lover, exactly like you! These bars look heavenly! 5 ingredients and less than 20 minutes to make? There is no excuse in the world NOT to make these delicious bad boys! SO YUM! Cheers, girlfriend! 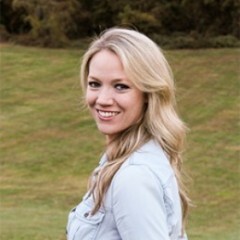 These are a favorite of mine Kelley! So delicious! I was so excited about this recipe, especially since my oven and stovetop are currently out of commission. I made these today, but, unfortunately, the graham cracker layer came out way wet. I’m wondering if maybe it was too much butter? Two sticks, right? These bars were intended for a potluck, but they’re too soft and messy to plate – my husband, however, was thrilled with that outcome and promptly ate another one, because the flavor is amazing! I am really surprised to hear that it was crumbly. This is one of my favorite desserts and I make it a lot and never have a problem with the graham cracker portion falling apart. Did you refrigerate it for long enough? Maybe placing it in the freezer will also help to firm it up and make it easier to cut. I hope this helps! Thanks! Did you add the graham crackers to the peanut butter, sugar and butter OR just to the butter as a graham cracker crust? I just made these and my bottI’m layer wawas way too liquidy. I’m thinking way to much butter to make a crust? Do these have to be refrigerated AFTER they are completed? Yes they should be kept in the refrigerator after they are completed. Hi, the recipe says 2 sticks (2 cups).. but a stick of butter is 1/2 cup. So, what is the correct amount?? Thank you! Wondering if anyone has tried with crunchy peanut butter. Crunchy peanut butter would be good in this! Is there a “healthier” substitution I could use for the powdered sugar by chance? Curious if anything else has been tried. Thank you!